Lime chichen, okra, and aloe vera are what my wife is taking for blood sugar control without medication or insulin injection. 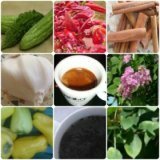 Did anybody ever try these plants for blood sugar control? what was the result of each one of them? First I want to congratulate for your success story of beating diabetes naturally. Hope you continue for long. The plants you are using (aloe vera, lime and okra) have certain components that make them powerful on optimizing blood sugar. If you are talking about lime chicken (instead of lime chichen), and if you use breast chicken (or turkey) boiled, baked or grilled with olive (or corn) oil dressing or other herbs mixture with lime as side dish, that sounds delicious and healthy. - in fibers: soluble and insoluble. It contains a fiber called "superior" as it inhibits the absorption of sugar from intestines. Furthermore, its mucilage have lowering-cholesterol properties as it binds cholesterol and smooths feces. On the other hand, insoluble fiber helps in forming feces mass in colon and alleviate the passage (with no injuries) in the colon. - it is also rich in vitamin and minerals such as vitamin B6, folic acid, vitamin A and C, potassium, calcium, iron, magnesium, etc; all the nutrients that diabetic mostly needs.